The year is 1902. The place is New York City. A famous stage actress has been found strangled in an artist’s studio, and the artist herself has vanished. Francesca Cahill, the city’s most unconventional heiress and famous amateur sleuth, is once again on the case–for the murder victim is none other than her brother’s mistress. And when the sole witness to the crime is also found strangled and only one clue is left behind–a silk stocking–it becomes evident that a madman is on the loose. 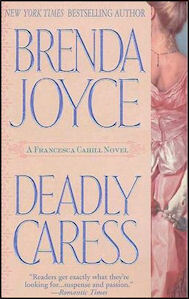 Listen to a audio clip from Deadly Caress, now available on Audible, an Amazon company. Francesca Cahill prided herself on her common sense, her steady, nonsensical character and her intellect. In fact, throughout the city she was considered not just a blue stocking and a reformer, but an eccentric. Recently, she had also become rather infamous as the city’s most successful and intrepid amateur sleuth. This was all much to her formidable mother’s dismay. Mrs. Julia Van Wyck Cahill, one of society’s leading matrons, wanted nothing more than to see her daughter successfully wed. Francesca, however, had other plans. Now, Francesca was in shock. She stared blindly out of the window of an informal salon with twenty-one foot vaulted ceilings and marble floors. The door behind her was locked. She did not know what to do, to think. For earlier that day she had received the most stunning proposal of marriage from the city’s most eligible (and most notorious) bachelor, Calder Hart. How happy Julia would be should she learn of his desire to marry her. Francesca was resolved that Julia never find out what had so recently upended her life. Francesca was terrified of Julia and Hart conspiring against her. After all, not only did she have no wish to marry, she was in love with another man. Tomorrow she would call on Hart and set him straight. How she dreaded the encounter, knowing that it would be an unpleasant one. Andrew Cahill was a benign man in appearance, rather stout, of medium height, and to look at him one would never guess that he was one of the city’s millionaires. He had made his fortune in meat-packing in Chicago, moving his family east when Francesca was a child—she was now a woman of twenty. Francesca was well aware that she was the apple of his eye, and not because her sister and brother were older than she was. While she did not take after Andrew in appearance, as she resembled Julia, being blond and blue-eyed, she resembled him in character. Andrew was an avid reformer, as politically and socially involved as any one of the Melons or the Astor’s. There was only one man whom she admired more—Rick Bragg, the city’s newly appointed police commissioner. Now, distraught and worried, she prayed that her distress did not show, as her father knew her too well and would demand to know what was bothering her so. Worse, she sensed he was looking for her and he did not look pleased, oh no. “You have a telephone call, Francesca. It is Rick,” Andrew said without smiling, his tone grim. She stiffened with surprise. It was late, and hardly the time for a social call—worse—he would be furious if he ever learned of his half-brother’s odd proposal. And now she knew why her father was disapproving—Rick Bragg was a very unhappily married man. Her parents did not like their friendship. She thanked her father, changed direction, and hurried into the library; a room paneled in wood with stained glass windows and beamed ceilings. The receiver was off the hook, on his desk. She lifted it to her ear. “Bragg?” She had to smile breathlessly, his image coming instantly to mind—handsome, golden, resolved. He was one of the most handsome men she had ever met, and more importantly, the most noble-minded. If anyone could reform the city’s terribly corrupt police force, it was he. Unfortunately, the political pressure he was under now to do so was vast. “There has been another act of vandalism, Francesca,” he said without preamble. She clutched the receiver, forgetting her personal dilemma instantly. Last week the studio of her friend, Sarah Channing, had been ravaged and nearly destroyed. The case had been temporarily shelved, however, as Sarah Channing had not been hurt. “Not another art studio?” She gasped. “Yes, and it has been thoroughly destroyed, in a similar manner to Sarah’s studio, but in a more extreme way. It gets worse,” Bragg added tersely. “How can it be worse?” She whispered, already sensing what was to come. “I’ll be right there,” she said, and she hung up the telephone, stunned anew. A killer was on the loose—another case was at hand. But this time the artist had been murdered. Francesca was suddenly afraid. Sarah’s life might very well be in danger, too. Francesca rushed from the library, determined not to alert anyone to the fact that she was about to enter another criminal investigation—one with Bragg at her side. Her family was well aware of her sudden penchant for sleuthing, as she had been a feature in the press several times, unfortunately. Neither her mother nor her father, Andrew Cahill, approved. And while Francesca was rather adept at wrapping her father about her little finger, Julia was a formidable opponent, indeed. Francesca wished to avoid her now at all costs, for otherwise she would never get out of the house at this hour and there was no possible way she could bypass up the scene of this terrible new crime. As she hurried upstairs, past a hallway lined with several paintings, an image of Calder Hart reared itself in her mind—darkly handsome, dangerously arrogant. Even the sudden happenstance of a new crime could not quite keep her mind off of the personal matters confronting her. And following his image came and equally compelling one of Bragg. She shivered. How had her life ever come to this impasse? She hadn’t meant to fall in love with him. But it had been impossible not to do so, with them working so closely together. And he despised his wife, who had left him four years ago, who roamed Europe while he paid her bills, collecting lovers. More dread filled Francesca. But Leigh Anne was no longer in Europe. She had returned to the city, and she had made her intentions clear. She wanted her marriage back—intact. “Miz Cahill?” He murmured, brushing long black bangs out of his dark eyes. And Joel was instantly awake. Their gazes met. Then he nodded, leaping out of bed as Francesca quickly left. A few moments later, she and Joel, both bundled up in their heavy winter overcoats, were slipping from the kitchen’s back door, so as to avoid the doorman in the front hall. Outside, the night was inky blue, with a million glittering stars-and it was frigidly cold. Snow-clad lawns encircled the mansion, and a gravelled drive led to a pair of wrought iron gates, closed now, which let out on Fifth Avenue. The gaslights there lit up not just the avenue itself, but Central Park on its other side. Carriages and broughams crowded the street, with one black motorcar in its midst. But as it was a weekday night, the traffic was moving quite swiftly. Francesca had just seen a horse and hansom. “Let’s run. There’s a cab,” she cried. Joel grinned at her as they raced up the slick, snow-covered driveway. “Looks like we’re in business again,” he said happily. Francesca raised her hand. “Cabbie! Cabbie!” She cried. The driver of the hansom saw her, yanked hard on his horse’s reins, the animal and cab veering abruptly towards the curb. The driver in the following carriage cursed, slamming on his brakes to avoid a collision, the two bays in the traces rearing in order to stop. Panting, Francesca reached the hansom. “Yes, Joel, we most certainly are in business once again,” she said, and now, she did smile. But it was grim, as murder was always a deadly affair.